Published: Jan. 29, 2014 at 04:18 p.m. Updated: Jan. 29, 2014 at 06:04 p.m.
JERSEY CITY, N.J. -- The Denver Broncos don't know how fortunate they are to have a top-five wide receiver alongside Eric Decker and Wes Welker. 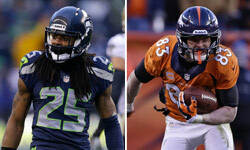 Can the Seahawks' historically stingy defense stop the Broncos' record-setting offense? Demaryius Thomas revealed Wednesday that his NFL career was almost derailed by injuries before it ever left the station. Back when he was known as "Bay Bay" as a Georgia Tech phenom, Thomas broke his foot training for the NFL Scouting Combine. His rookie season was essentially a wash after twice aggravating the injury in preseason action. Two months into his first healthy offseason, Thomas tore his Achilles tendon. Although surgical techniques and accelerated rehab schedules have advanced Achilles recoveries in recent years, Thomas went under the knife unsure if he would regain his pre-injury form. "Two years straight that I was injured, and you know that was tough," Thomas said Wednesday. "When I was coming back off my Achilles (injury) I broke my pinkie (finger) and I was out another six weeks, I used to second-guess myself sometimes and see if football was really for me. I used to talk to my uncle, my dad and my mom." Thomas is now held up as the rare example of a player who has actually improved following Achilles surgery. Decker and others have raved about Thomas as one of the most physically gifted receivers in the game this week, but coach John Fox and wide receivers coach Tyke Tolbert emphasize a polish acquired by honing his craft over the past three seasons. "He's 6-(foot)-3 and 230 (pounds), but he can run routes like a 5-10 guy," Tolbert said Wednesday. "He works at it every day. We work at a lot of stuff at the top of our routes in order to be able to get open. I think he does a good job of that." In a media-saturated week of frivolity, it's instructive to remember that the majority of the players have worked hard to overcome injuries and bad luck en route to the Super Bowl. The latest "Around The League Podcast" breaks down the Media Day stars and reflects on the significance of Super Bowl XLVIII. "RB Dalvin Cook hasn't 'scratched the surface ..."